Typically my dreams revolve around my training. Sometimes it is a dream about the big race feeling the adrenaline pump through veins starting every race or the anxiety that comes over me race morning in anticipation of the start of the race. Other times it has to do with training. I often have running dreams. These are typically my favorite dreams because there isn’t anxiety or stress. When I am running I feel super light as if I was flying. I just feel really free in these dreams. Which brings me to my dream I had a few nights back. The dream seemed really clear – I remembered so many details. I could remember the feelings and emotions as if it was real. 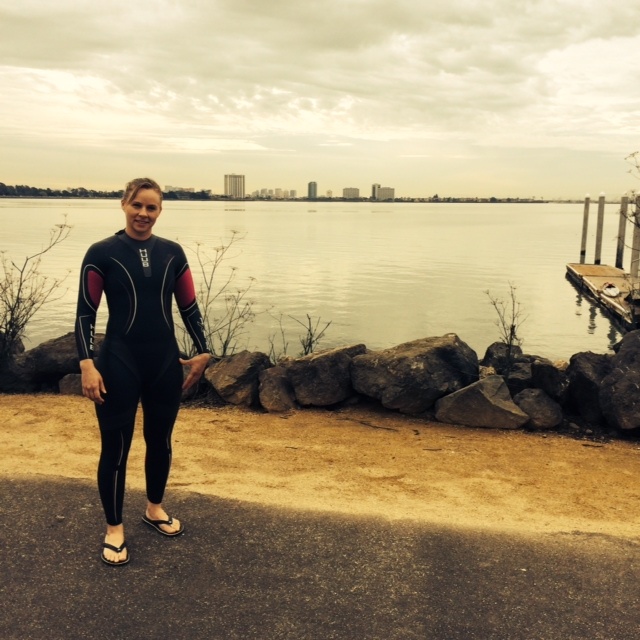 This was a very different dream…a dream where the sport of triathlon meets secret agent. “Korrie Hicks, bib number 1468” I said. As I walked to T1 I sifted through the package for my next steps. Goggles, swim cap, and an envelope. I opened it and pulled out the note. You will find all your necessary gear at #1468 at the start transition. Put the gear on and proceed to the waters edge. Once you reach the island you are to head to T1 for your next instructions. Be careful Agent Hicks you are entering dangerous waters. Struggling a bit, as I normally do, I carefully put on my wetsuit while glancing around at the different faces in the crowd. Everyone seemed to be in their own zone. Some sitting quietly and others fiddling with their gear. You can sense the nervousness in the air. Wetsuit on, goggles and cap in hand, I proceed to the water. It is eerily dark. I put my cap on and then slide my goggles on over my eyes. I enter the water near a dock and swim quietly between the pillars. A sudden “bang” rings out in my ear and thrashing of limbs above me, beneath me overcome by body. Survivalist in me kicks in and I quickly begin to swim bringing each arm down through the water forcefully as if I was a windmill. I take in water through my nose and begin to cough, fighting to keep my head above water; gasping for air. I break away, the waters calm and the thrashing of limbs subsides. I settle into a rhythm. As the sun begins to rise I finally reach the islands edge and scan the beach for path to T1. I spot it off to the right about 100 yards. The path is surrounded by large tropical plants completely covering the ground and rising high above my reach. I pop to my feet and begin running toward the path. I hear a deep breathy voice behind me. “Hicks”, “Hicks” I heard. I turned around and slowed my pace to see a stout older man jogging toward me. “Yes” I stated. Staring at me intently I wondered if this was Agent Sky. I dare not say his name…but he did know my name so maybe it was safe. I wondered if I should use the code name. hmmm. The stout older man looked deep into my eyes, hands me a note and continues on down the path. Breathing heavily I continue my jog up the path. I open the note. You will find your bike in T1 adjacent to the 2nd lamp post on your left as you enter the transition. Leave your swim gear and quickly head east on of the transition on your bike. You will see a large oak tree to your left. Follow that road 56 miles. You will find the package sitting against the mailbox. Take that package to the finish line and hand it to Agent Storm. Agent Storm will provide you with the code word you were given at the beginning of this mission. I fold up the note and proceed to T1. Stripping the wetsuit down I grab my helmet, my shoes, slide my glasses on, mount my bike and begin to peddle. In my mind I thinking its time to rock this (I’m pretty sure some heavy metal music was playing in my ears). And then I woke up…….. So this was my short little dream. I don’t write stories so forgive me if my punctuations are way off and I am certain I left out details that I just can’t articulate. This dream felt really intense and real. I don’t typically remember my dreams in such detail either. I love spy/secret agent movies so this dream was actually lots of fun. I have really dissect this dream to pieces but will leave it to you all to share your thoughts and wisdom…..